Airfare from Knoxville or Nashville and Fees for 1 Bag per person included. Last year we few Alaska Air out of Nashville. Highly recommend trip cancellation insurance. We are departing on a wonderful and memorable journey so let us be on our way and discover this Great Land from the waters of the Inside Passage to the wide open interior. We arrive in Anchorage in the early evening and check into our hotel for the next three nights. Anchorage, Alaska’s largest city, sits at the base of the Chugach Mountains along the coast of Cook Inlet in Southcentral Alaska. You can see the Chugach, Kenai, Talkeetna, Tordrillo, Aleutian and Alaska mountain ranges from Anchorage. Leisurely morning at the hotel to rest-up from yesterday’s fight. By midmorning we step aboard the Anchorage Trolley and enjoy a 15 mile tour through Alaska’s largest city. Relax while a lively, informative, Alaskan guide shares history, family stories and explores Anchorage’s past and present.Tour Highlights Include: Mysterious Earthquake Park, Alaska Railroad, Westchester Lagoon, foat planes departing from Lake Hood and Lake Spenard, breath-taking mountain ranges, Anchorage’s historic neighborhoods, wildlife sightings, Anchorage’s famous fowers and much more! Rest of the day free to explore Anchorage on your own. There are several great museums in Anchorage: The Anchorage Museum, the Alaska Native Heritage Center, Alaska Experience Theatre—for a frst-hand experience with the 1964 Good Friday Earthquake – the most powerful tremor ever recorded in North America, the Oscar Anderson House in Elderberry Park to name a few. Yes, there’s plenty of shopping and no sales tax is an added beneft. Most of the local gift shops will ship purchases around the world. Ride aboard a piece of Alaska’s history. The Alaska Railroad was built in 1915 to transport supplies from the port of Seward to interior Alaska. 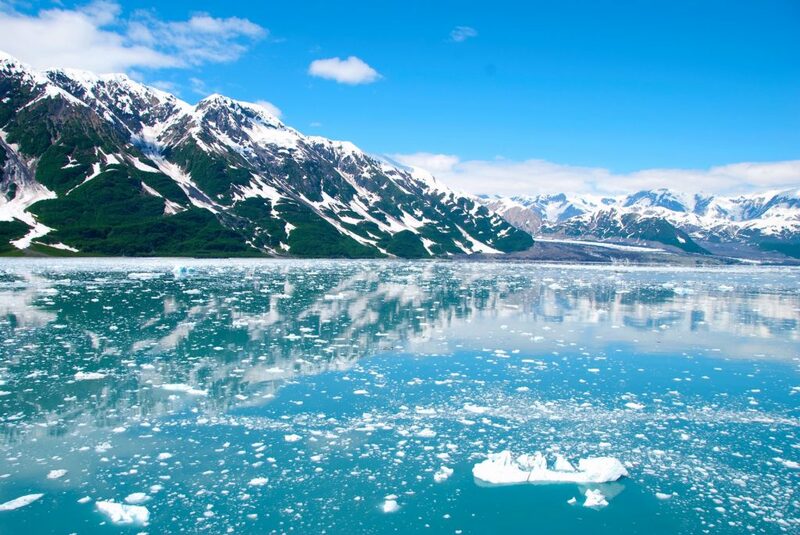 Get a backyard view of Alaska’s neighborhoods as you depart Anchorage toward Turnagain Arm where the train travels along the waters edge, allowing for an amazing view of the dramatic tides found in this region of the world. Local guides aboard the train will point out sites along the way. Just imagine seeing 26 glaciers in one day! Yes, you will on this exciting 6-hour cruise on the calm, protected waters of Prince William Sound. Take in the beauty of rugged, snow-capped mountains and tree-lined fjords and experience a close-up view of an amazing array of wildlife. . . whales, sea otters, seals, eagles, sea birds . . . just to name a few. Lunch is included on the Cruise. We reboard the train for our return trip to Anchorage. This morning we will be transported to the train station to board Alaska Railway for a delightful journey to Denali National Park. The train will pass over Hurricane Gulch and through Broad Pass. The bridge at Hurricane Gulch spans 918 feet, some 296 feet over the Chulitna River. We arrive in Denali National Park for a two night stay. Mt. 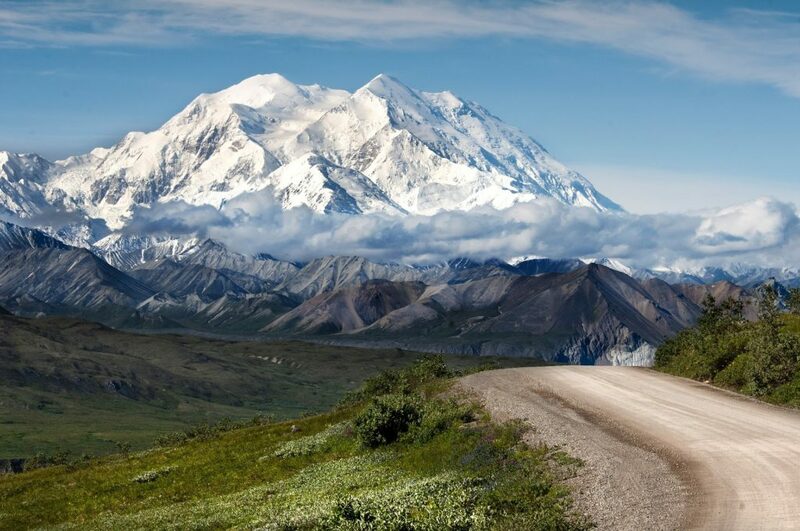 Denali is the highest peak on our continent, rising to a height of 20,320 feet. We’ll arrive at Denali with time to relax before leaving for an evening of entertainment at Alaska Cabin Night. A taste of Old Alaska, the popular dinner theater performed performed in an authentic log paneled roadhouse. After dinner we’ll sit back and enjoy a hilarious show of tall tales, funny songs and foot-stompin’ music. This morning is free in Denali with time to explore the natural beauty of the park or attend the Dog Sled Demonstration. After lunch in the park, we board a Denali tour bus for an exciting excursion through our nation’s most untamed National Park, Denali. Keep a close watch! Chances are good that you’ll spot bear, moose, fox, sheep, and other animals along our route with more fantastic views of Mt. McKinley, so don’t forget your camera! A box lunch is included on the tour arriving back at our lodge in the evening for overnight. Sit back and take in the magnifcent views of snowcapped mountains and craggy peaks as we travel to Fairbanks. We are joined by a local guide for an interesting sightseeing tour of Fairbanks and the surrounding area. Learn what it takes to survive in an environment that sees the sun for only a small portion of the year. Also tour the University of Alaska Museum, with Indian artifacts, gold, and an eight foot tall brown bear. Tonight you’re in for a traditional Alaska Salmon Bake in Fairbanks. They also have halibut and steak. The food is plentiful, so eat hearty! We enjoy a delightful show after dinner. We spend the night in Fairbanks. This morning we board the pioneer Binkley family’s sternwheeler riverboat, Discovery, for a half-day cruise of the Chena and Tanana Rivers. See an authentic trapper’s base camp, Indian fsh wheels, sled dogs, and view homesteaders’ riverside log homes. We see where Susan Butcher, four time Iditarod Trail Sled Dog Race Champion lived. We’ll pass famous Cripple Creek of gold rush fame and learn more about Athabascan Indian culture. Lunch today is in a restored pump house, served buffet- style, piping-hot and ready to eat. After lunch, we depart Fairbanks traveling to Tok. A quick stop at North Pole, Alaska to shop at the Santa Claus House. You may want to mail a Christmas card home from the North Pole while you are here. We will travel through Delta Junction, the offcial end of the Alaska Highway arriving in Tok for the night. Tok began in 1942 as an Alaska Road Commission camp used for construction and maintenance of the Alaska Highway. So much money was spent in the camp’s construction and maintenance that it earned the nickname “Million Dollar Camp” from those working on the highway. This morning we leave Tok and travel the Alaska Highway making photo stops along the way with lunch included in Destruction Bay at the Talbot Arm Motel and Restaurant with arrival in Whitehorse late in the afternoon for our next overnight. We depart Whitehorse this morning traveling to Skagway, a compact city in southeast Alaska, set along the popular cruise route the Inside Passage. It’s home to gold-rush-era buildings, now preserved as part of the Klondike Gold Rush National Historical Park. We board the Fjord Express and head south through Lynn Canal, the conti- nent’s longest and deepest glacial fjord. Lynn Canal stretches over 100 miles long and is over 2000 feet deep. Marine life abounds in these waters, and a fully-narrated wildlife cruise will highlight our morning voyage. You’ll see hanging glaciers, nesting bald eagles, harbor seals, and humpback or killer whales. Upon arrival at Auke Bay, board a motorcoach for a transfer to downtown Juneau. Along the way, we’ll see the city’s highlights, includ- ing the state capitol building and the governor’s mansion. The bus drops off at Marine Park on the waterfront, with easy access to restaurants and shopping. You’ll have approximately three hours of “free” time to explore downtown before re-boarding the bus for spectacular Mendenhall Glacier. At the glacier, spend an hour walking the trails, taking photos and checking out the US Forest Service visitor center before the bus returns you to Auke Bay for the evening cruise back to Skagway for our last night. Morning free for shopping and browsing in the quaint town of Skagway. Skagway owes its birth to the gold seekers. During the gold rush Skagway’s population boosted to 20,000; however, the 2010 census had the population of the city as 920. The name Skagway is said to mean “Home of the North Wind”. It is the oldest incorporated town in Alaska. The port of Skagway is a popular stop for cruise ships, and the tourist trade is a big part of the business of Skagway. We depart Skaway aboard The White Pass and Yukon Route narrow gauge railroad, part of the area’s mining past, now in operation purely for the tourist trade and running throughout the summer months. Take an unforgettable journey aboard “The Scenic Railway of the World” to the White Pass Summit and travel 20 miles from tidewater, to the Summit of the White Pass – 2,865 feet. We take the train to White Pass Summit and Fraser one-way. Our motorcoach and driver will meet us in Fraser and take us to Whitehorse, Yukon for the night. Today we are off to Dawson City. The heart of the Klondike Gold Rush is our home for the night. An incredible community that has preserved its past, Dawson City invites you to turn back the pages of time and experience their rich living history. Meander the wooden boardwalks and visit national historic treasures. Spend a night on the town in one of the most entertaining communities of the North, home to Diamond Tooth Gerties. Today, we take you across the beautiful “Top of the World” highway with a stop in Chicken, Alaska. This town would have been called Ptarmigan but no one could spell it, so the post offce is Chicken. We continue to Tok for the night. This morning we depart Tok traveling back to Anchorage by way of Palmer and the Matanuska Valley. It is known for the world record sized cabbages and other vegetables displayed annually in Palmer at the Alaska State Fair. We stop at the Visitor’s Center and Gardens at Palmer in the heart of the rich farming area of the Matanuska Valley for another look at some record size vegetables grown in the area. We continue to the Anchorage airport for our return fight to Knoxville or Nashville. Our fight arrives in Knoxville or Nashville today ending our wonderful adventure to the Last Frontier with Knoxville Tours. We will board our Knoxville Tours coach and return to Knoxville or the city where we picked you up the morning of departure.